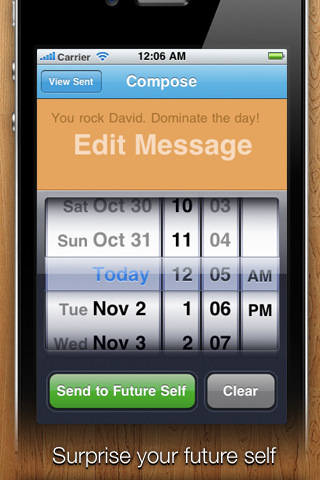 DBelement, LLC is pleased to announce the release of HiFutureSelf version 1.5.5 for the iPhone and iPod touch. This amazingly simple app lets you to send messages to yourself in the future, or to your future self. HiFutureSelf is fast, easy and unbelievably convenient. The new version enhances a social layer to the future messages. 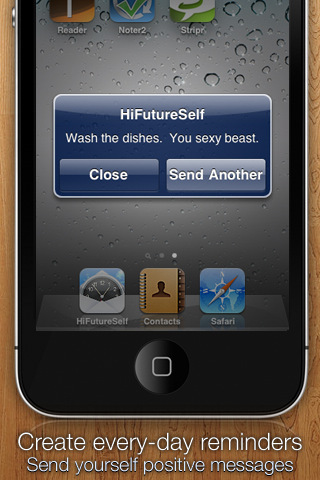 You are allowed to instantly share messages via e-mail, SMS, Facebook, and Twitter within the HiFutureSelf app. The update also adds 6 high quality custom ringtones to stress the feel of the future messages. The app brings comfort and pleasure of text messaging to in order to set up alerts and reminders. With as few as two taps you can set up reminders for your daily routine, not to forget something important. There are so many calendar and to-do note apps with alerts to help you clear out your multi-tasking job, but they are all clunky and unproductive for the one thing you really need, quick instant prompts. The app is free and available exclusively through the App store!